In order to easily reference the Park's different entrances, the 1862 Board of Commissioners of Central Park decided to name Central Park's gates. After rejecting many ideas for naming conventions – including references to war victories, the names of the states, important cities in the Union, or names of prominent men – the Park commissioners suggested naming the gates after the vocations and groups who made New York City the great metropolis that it had become. Originally, the Board of Commissioners wanted to install small statues at each Park entrance representing the group for which the gate had been named. While the idea did not fully come to fruition, two gates do have nearby homages to their namesakes. You can find these statues at Inventors' Gate (East 72nd Street) in the form of Samuel F.B. Morse, and at Naturalists' Gate (West 77th Street) with a statue of Alexander Von Humboldt. While the names were used on maps and colloquially, the gates were not inscribed with their names until 1999. At the urging of Parks Commissioner Henry Stern, the Central Park Conservancy undertook the job of inscribing the names of each gate into the Park's wall to preserve the historical character of the gates, and to underscore the importance of Central Park as a Park for all New Yorkers. 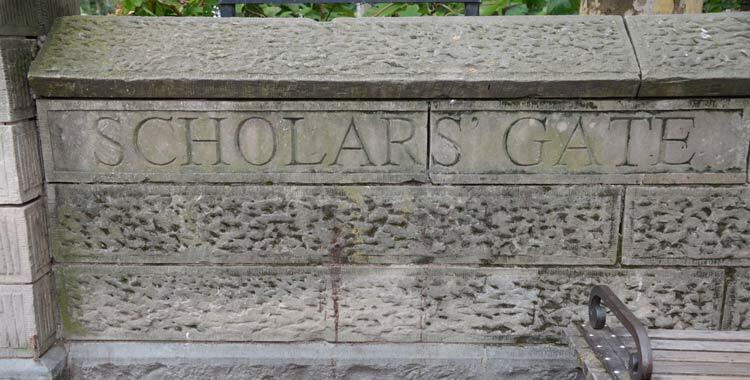 A full listing of Central Park's named gates is below. The Park also has three entrances featuring ornate, decorative gates. These are the Osborn Gates, Engineers' Gate, and the Vanderbilt Gate. In 2015, the Central Park Conservancy restored the Park's entrance near the Arsenal at East 64th Street. In the spirit of maintaining the gates and the Park as a representation of all New Yorkers, the Conservancy added an accessibility ramp where previously there had existed only stairs.